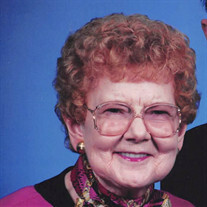 Elenora Elizabeth Steibel, 96, of Hannibal, Mo. passed away at 1:20 p.m. Tuesday, January 26, 2016, at Hannibal Regional Hospital. Funeral services will be held 10:00 a.m. Friday, January 29, 2016, at the Smith Funeral Home & Chapel. Pastor Dan Jones will officiate. Burial will be in the Grand View Burial Park. Visitation will be held 9:00 to 10:00 a.m. Friday, January 29, 2016 at the Smith Funeral Home & Chapel. Elenora was born November 6, 1919, in Hannibal, Mo. the daughter of Richard and Effie Mae (Williams) Aldrich. She was married to Lawrence "Larry" Steibel on July 22, 1961 in Kenosha, Wis. Survivors include her husband Lawrence "Larry" Steibel of Hannibal, Mo. and special family friends, Kenny and Karen Glascock of Hannibal, Mo. In addition to her parents, Mrs. Steibel was preceded in death by one brother, Guy Richard Aldrich, two sisters, Minnie Snell and Mary Alberta Benn, and one niece and two nephews. Elenora and Lawrence met at a dance hall in Racine, Wis. They both had a passion for country music and dancing. Every Friday night Elenora and Lawrence would travel to Frankford, Mo. to the Wagon Wheel Opry House to enjoy the music and dancing. After the Wagon Wheel Opry House closed down they would often go to the Junction in Perry. Elenora was a member of the First Methodist Church in Hannibal. Memorial contributions may be made to the James E. Cary Cancer Center, in care of the Smith Funeral Home & Chapel.